This Month’s Topic: Vegan or Peleo? Healthy Deliberations is a monthly gathering with an intention to develop a place and a protocol where disagreements are discussed in a friendly manner, with the goal of understanding and appreciating the perspective of others when we are in opposition. The goal is for all of us to learn and grow into better communicators to avoid stress from conflicting views on pertinent issues. We will use a multitude of techniques to keep us timely, civil and make sure everyone is heard and respected throughout the discussion. We appreciate and promote passion without dogma. We need everyone to have open ears and hearts, and practice being courteous, concise and non-judgemental in sharing their views. Each month will have a different currently polarizing topic. 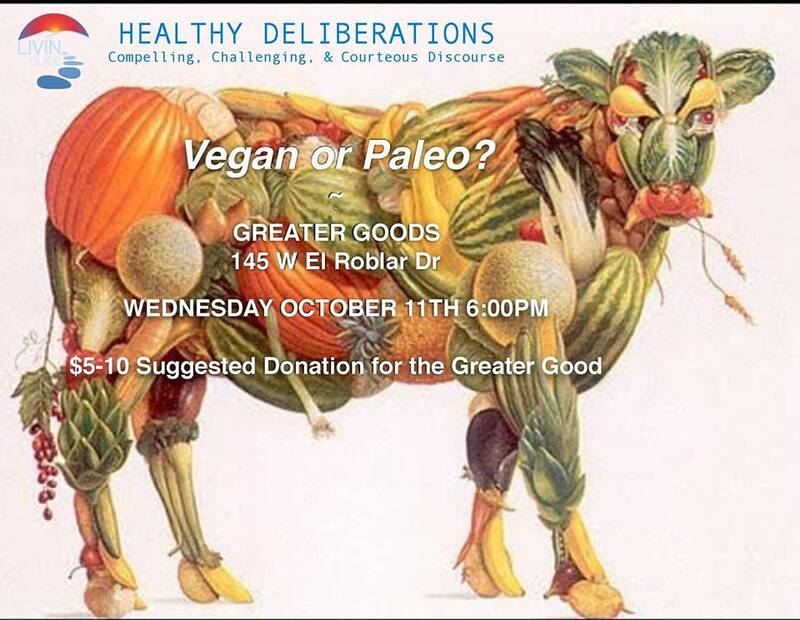 Join us for our inaugural Healthy Deliberation – Vegan or Paleo? We’ll be sharing the perceived and true positive and negative potential aspects to our health when choosing what diet is best for our health and the planet.